A new report shows that not only were homeless deaths in 2017 higher than in any other year, but there have been more deaths in the last six years than anyone thought. Throughout 2017, advocates for homeless people monitored the rising list of people dying without homes. By April, King County appeared likely to have more deaths than the previous year; by September, the count passed the previous year’s total, and by November, it exceeded the previous record set in 2006. But in a new report issued this week, the King County Medical Examiner tragically capped the year with an even higher number of deaths: 169. That is 32 more than last year, and more than double the number of deaths six years ago. 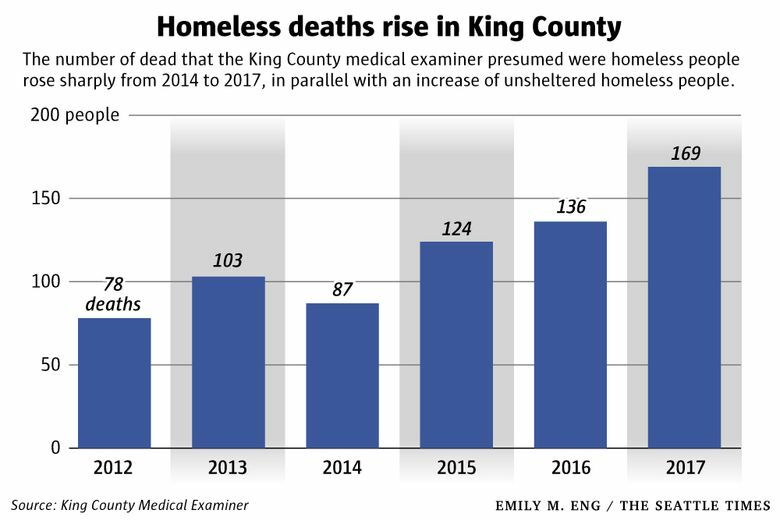 In the comprehensive report, the medical examiner also analyzed all the homeless deaths they identified over the last six years, and their report sheds insight into where, how and which people die without a home in King County. The total homeless deaths since 2012 — 697 people — and the 2017 total are higher than previously reported because the medical examiners’ staff found previously uncounted deaths of people presumed to have been homeless. The medical examiner said this is actually a fraction of all homeless deaths, since it only includes deaths where the person was presumed homeless and didn’t die of natural causes. The medical examiner defines “presumed homeless person” as someone who didn’t have permanent housing, and determines this from where and how they died, and sometimes testimony from next of kin. Compared to all King County deaths investigated by the medical examiner, homeless people died younger: 87 percent of them were under 65, whereas 25 percent of non-homeless people died by that same age. They also were much more likely to be men and were disproportionately people of color. And fatal overdoses from drugs or alcohol were also far more common among people who died while homeless than those who were not, especially among younger homeless people. Overdoses caused nearly one-third of the deaths among homeless people, most often attributed to opioids or heroin. But the report also spotlights a sharp rise in methamphetamine overdoses among homeless people, with a fourfold increase between 2012 and 2017. Brad Finegood, assistant director of King County’s Behavioral Health and Recovery Division, said more methamphetamine is coming across the southern U.S. border and up the Interstate 5 corridor. And it is very cheap on the streets, he said. About half of the deaths of homeless people happened outdoors, mostly in parks or uninhabited areas outside; four percent occurred in encampments or abandoned camp sites. For those who died inside, the most common location was at a health care facility. Only five percent died in shelters or social-service agencies. Downtown and Central Seattle was the site of more deaths than anywhere else — more than a quarter of homeless deaths countywide. Black and Native American people had a significantly higher proportion of deaths in the homeless population, according to the report. In 2016, African Americans accounted for six percent of King County deaths but 14 percent of the deaths of homeless people; Native Americans accounted for only one percent of all deaths but eight percent of homeless deaths. More than a third of homeless deaths in the last six years were of natural causes, such as heart disease. Four percent of deaths were at least partly due to hypothermia or cold exposure. In a previous report, King County Medical Examiner Dr. Richard Harruff said people without homes are eight times more likely to die of hypothermia than those with homes in King County. When Kira Zylstra, the acting director of All Home, King County’s homelessness coordinating agency, saw the report, she was horrified but not surprised. The point-in-time count of unsheltered homeless people — those living outside or in vehicles — has more than doubled in King County since 2012, to 5,485 last year. The method of counting homeless people has changed to make it more comprehensive, but Zylstra points to the worsening affordability crisis on the West Coast. Anitra Freeman reads the list of homeless deaths every month as they come from the medical examiner, and said last year was very tough emotionally. A formerly homeless woman herself, Freeman helped start a group called Women in Black, which has held a vigil every month since 2000 for the deceased homeless people in King County. Freeman, however, fears that 2018 may be worse. Thirty-nine homeless people have already died in January and February alone, on pace for more than 230 deaths. “We’ve never seen a year like this,” Freeman said.